1 oz lot of 100. 1 oz lot of 500. 2014 500-Coin Silver Eagle Monster Box (WP Mint, Sealed) - SKU #83788. Each box comes sealed from the U.
Mint, ensuring the coins have not been searched or sorted. Each coin contains 1 oz of. This sealed Monster Box contains 500 coins for a total of 500 oz Silver. Weinman's design showing Lady Liberty draped in an American Flag, walking gracefully as the sun rises over a ridge. Reverse: A heraldic eagle is shown below 13 small stars, representing the original colonies. The Silver American Eagle has become the most popular bullion coin in the United States. 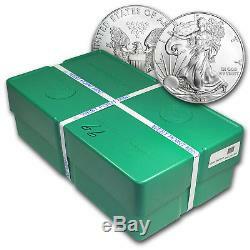 Add the sealed Monster Box of 2014 Silver American Eagle coins to your investment today! Each package is fully insured. APMEX does guarantee that every item that we sell is genuine and that all Precious Metal items do contain the weight, fineness, and purity that we have advertised. However, all investments, of every type, involve some level of risk and Precious Metals are no exception. Like many markets, the Precious Metals market is speculative, and it is unregulated. The value of any Bullion item is generally determined by current spot price of the underlying Precious Metal and by the supply and demand for these particular items. These prices will fluctuate throughout the day while the Precious Metals market is open. If you are considering purchasing Precious Metals as an investment, you should assess the stability of the current market and contact your financial advisor for all advice. Definitions The following terms have the following meanings in these T&C: 1. The term "APMEX" means APMEX, Inc. The term "Bullion" is used to describe (1) Gold, Silver, Platinum or Palladium Coin(s) which closely follow spot prices and have little or no Numismatic value (such as restrikes); and (2) the form in which metal is shaped such as bars, ingots or wafers. It is APMEX's goal that any disagreement or dispute be resolved expeditiously. If an amicable resolution cannot be reached, you agree that any and all disagreements and disputes between us shall be resolved in accordance with the following paragraphs: (a) Forum Selection and Governing Law. All such disputes shall be resolved exclusively in such federal and state courts, as appropriate, in that jurisdiction. You hereby consent to personal jurisdiction and venue in those federal and state courts for the purpose of resolving any disagreements or disputes between us and waive all objections to the jurisdiction of such federal and state courts. Any action arising out of or relating to these T&C shall be governed by, and interpreted in accordance with, the laws of the State of Oklahoma, without regard to conflict of laws principles. (b) Waiver of Jury Trial; Arbitration. If APMEX cannot perform any obligation hereunder as a result of any event that is beyond its control, APMEX's delay or failure to perform such obligation shall be excused and APMEX shall not be liable for any damages as a result of, or in connection with, such delay or such failure. You shall execute and deliver such other documents and take such other actions as may be reasonably requested by APMEX to carry out your obligations under these T&C. Except as otherwise provided herein, all notices and other communications to APMEX shall be directed to APMEX, c/o Chief Financial Officer, 226 Dean A. McGee Avenue Oklahoma City, OK 73102, and all other notices and other communications to you shall be directed, at the option of APMEX, to the address that you provided to APMEX at the time of your registration. A decision or a failure by APMEX to take action with respect to any non-compliance by you of your obligations to APMEX or to insist upon strict adherence to any term in these T&C, does not affect the ability of APMEX with respect to any other non-compliance by you, and does not waive or limit APMEX's right thereafter to insist upon strict adherence to that or any other term, whether of a similar or dissimilar nature. The item "2014 500-Coin Silver Eagle Monster Box (WP Mint, Sealed) SKU #83788" is in sale since Wednesday, December 9, 2015. This item is in the category "Coins & Paper Money\Bullion\Gold\Other Gold Bullion". The seller is "apmex" and is located in United States.